What kind of judge is God if He punishes an innocent person for someone else’s crimes? How could you possibly call that justice? We would never allow that in our justice system. The central point of your doctrine not only makes no sense, it’s also immoral. 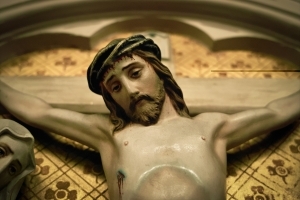 Is the idea that Christ paid for our sins immoral? What do you think? We look forward to your ideas, and Brett will let you know how you did on Thursday. Wow… First off, I’m guessing those so called Christians aren’t really Christians. So to say our judicial system would never allow that to happen just isn’t true. But that is besides the point right? That is just an assertion from someone that doesn’t know the facts. What we have here is a category error. The Christian claim is that Jesus is God. So Jesus wasn’t like “us” as in just another human being, but he was God incarnate. God isn’t punishing someone else, he is offering Himself as a substitute. This was a self-sacrificing act on God’s part. And if God took our punishment on himself, that really isn’t immoral, now is it? Albert, I think you’ve got the wrong idea about what it meant by saying our judicial system wouldn’t allow an innocent person to be punished for somebody else’s crime. They don’t mean our judicial system doesn’t MISTAKENLY punish innocent people. They mean the judicial system doesn’t CONDONE punishing innocent people. The comparison is made because God DID condone Jesus’ crucifixion for our sins. Topothemornin, You are correct. I was readying it wrong. Thanks for the correction. That makes more sense then how I was thinking about it. What? They’re not really Christians then are they? The vicarious penal substitutionary atonement of Christ for us is rather central to Christianity. Without it, we have no real hope, and there’s no point to being Christian. But to deal with the objection: God took the punishment upon Himself, not some innocent 3rd party. A proper understanding of the Doctrine of the Trinity puts this objection to rest. I agree, but when I tried to put in a qualifier, the sentence got too awkward! I figured people would understand I meant people who claim to be Christians. Whether or not they are is another story altogether. One part of the response has to be pointing out the fact that God poured the punishment on Himself, as I think a number of people have already said. Still, I think there is more that needs to be clarified, explained and defended than just this one point. The objection seems to take the form of, “Christianity (or rather penal substitutionary atonement) requires a justice system X. We as humans do not use justice system X, therefore the doctrine does not make sense and is also actually immoral”. First off the conclusion does not follow from the premises. Yes this doctrine is predicated on penal substitution, but even if it’s true that a lot of humans do not use penal substitution, why does that mean the doctrine makes no sense? And is immoral even? So there are obviously missing premises in this argument and for good reason: the premise would have to be something like, “a divine form of justice which doesn’t take the form of a justice system which humans do *in fact* use, is *immoral*”. Now I emphasised those parts to point out how the objector moves from a descriptive statement to a prescriptive one. So what if God’s justice is different from the way we operate? Is it not the case that, if the Christian God exists, we positively would *not* expect God’s ultimate form of justice to be the same as the way we operate in our western liberal democracies today. That’s for two reasons: a) human fallenes & b)the Creator-creature distinction. b) First. At this point I would like to jump straight to Isaiah 55 (which is one of my fav chapters in scripture) but specifically verses 8 & 9, “For my thoughts are not your thoughts, neither are your ways my ways, declares the LORD. For as the heavens are higher than the earth, so are my ways higher than your ways and my thoughts than your thoughts”. We shouldn’t expect God’s standards to be identical to our standards simply because he is not like us in many ways. His ways are on a completely different level, so higher, more sophiticated than any system we could come up with. So much so that in many ways we cannot completely, or even get close to, understanding the way he does things. a) next. We should not expect God’s form of justice to be perfectly or even noticably reflected in human systems because we are fallen and our systems, without divine intervention, could never reach God’s perfection. In fact in the way we respond to God’s sacrifice illustrates our fallenness, that we would reject God’s rescue plan, of solving the human problem as being “immoral”. How typically fallen of us! But I’m not sure I even accept the premise that “we would never allow that in our justice system”. I agree with equating the crucifixtion to a debt payment rather than retribution. In our society, someone would be allowed to pay a debt for someone else. As far as I know, courts do not specify how a person must pay back a debt provided that the debt is paid off. Did Jesus Never Say Anything about Homosexuality?